Do you dream of flying over the most beautiful locations of Tenerife? Are you craving the feeling of absolute freedom you can only get when you are up in the air? Then you have found your next adventure: a paragliding tandem flight in Costa Adeje. We offer you a paragliding tandem flight in Costa Adeje to help you get a different point of view of the island. See all nature and the ocean from 700 or 2.200 meters above the ground, depending on the experience you choose. 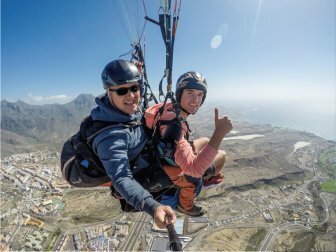 If you needed one more reason to choose the island as your next destination, paragliding tandem flight in Costa Adeje could be the excuse you were looking for. 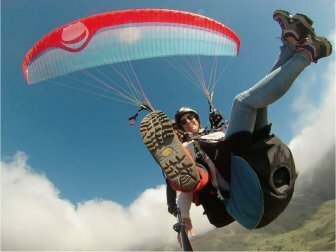 WHY SHOULD YOU CHOOSE A PARAGLIDING TANDEM FLIGHT IN COSTA ADEJE? You can’t imagine how lovely our island is. 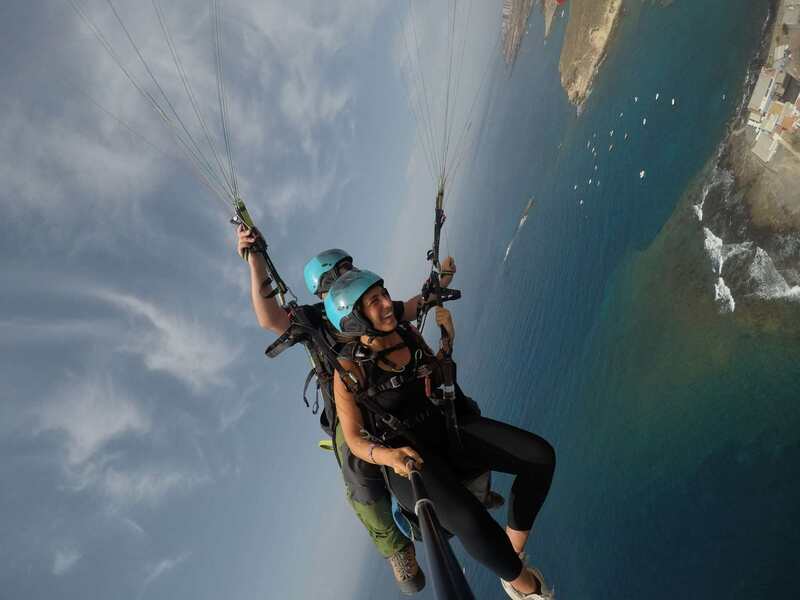 A paragliding tandem flight in Costa Adeje is the perfect way to discover all the secrets Tenerife hides. Get started with our most popular experience, a tandem flight over Adeje. As you can imagine, you can’t wear whatever you want to a paragliding tandem flight in Costa Adeje. Leave the fancy clothes at your accommodation and choose something comfortable, including a pair of sneakers and your sunglasses. You will also need the right equipment for your tandem paragliding experience. That’s completely on us: we will give you a helmet and a harness that adjusts to your body before we take off. The equipment is included in the price. Our paragliding tandem flights in Costa Adeje allow you to fly over different locations on the island. You just have to read each one of our services and choose your favorite one: Barranco del Inferno, Roque del Conde, Fañabe… It’s up to you! Our instructors know by heart the paragliding maps we have designed, so they will show you all the places you have to see (and take pictures of) before you go back home. Have you ever stopped to look at the birds crossing the sky with no effort? We’re going to tell you their secret: they are gliding. And that’s exactly what a paragliding tandem flight in Costa Adeje does. The wind is our ally! This sport requires an experienced instructor to take the controls of the advance paraglider. Don’t worry about that! Our team is the best on the south of the island, so we will take you to the nicest places.